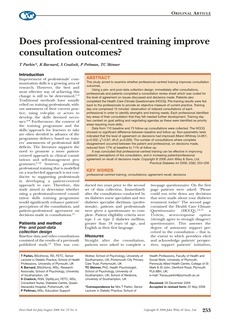 eCite - Does professional-centred training improve consultation outcomes? Does professional-centred training improve consultation outcomes? This study aimed to examine whether professional-centred training improves consultation outcomes. Using a pre- and post-data collection design. Immediately after consultations, professionals and patients completed a consultation review sheet which was coded for the level of agreement on issues discussed and decisions made. Patients also completed the Health Care Climate Questionnaire (HCCQ). Pre-training results were fed back to the professionals to provide an objective measure of current practice. Training day one comprised 10 minutes' observation of videoed consultations of each professional in order to identify strengths and training needs. Each professional identified key areas of their consultation that they felt needed further development. Training day two centred on goal setting and negotiating agendas as these were identified as priority areas requiring more skills. Data from 110 baseline and 73 follow-up consultations were collected. The HCCQ showed no significant difference between baseline and follow-up. Non-parametric tests indicated that the level of agreement on decisions had improved (Mann-Whitney U=951; p=0.002; χ2=3.67; df=2; p=0.026). The number of consultations where complete disagreement occurred between the patient and professional, on decisions made, reduced from 17% at baseline to 11% at follow up. It was concluded that professional-centred training can be effective in improving patients' perceptions of the consultation, and in increasing patient/professional agreement on recall of decisions made. Copyright © 2006 John Wiley & Sons, Ltd.